LEO VARADKAR IS visiting Irish troops based in Lebanon as part of a United Nations (UN) mission. The Taoiseach, Defence Minister Paul Kehoe and Chief of Staff of the Defence Forces Vice Admiral Mark Mellet are visiting troops who will be based in the region over Christmas. 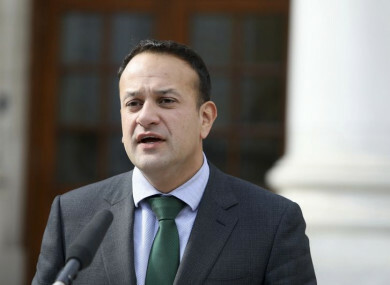 The Department of the Taoiseach said, in addition to meeting serving personnel, Varadkar will “witness joint operations exercises with the Lebanese” and survey the UN-monitored ‘blue zone’ between Lebanon and Israel. Later today, the Taoiseach will lay a wreath at the memorial to Irish personnel who died while on service in Lebanon. Ireland has participated in the United Nations Interim Force in Lebanon (UNIFIL) mission since it started in 1978 and it is Ireland’s largest overseas deployment. Some 377 Irish people are currently deployed there, principally comprising the 111th Infantry Battalion. Varadkar said: “Next year will mark the 40th anniversary of UNIFIL, the United Nations Mission in Lebanon. The Irish Defence Forces have been there from the start. As a people, we are enormously proud of the work that our Defence Forces do in keeping the peace, often in dangerous circumstances. As a small neutral country with no history of colonialism, and as a country at the heart of Europe, Ireland plays a leadership role when it comes to peacekeeping around the world. We will continue to do so. This Christmas some 580 troops will be serving overseas in locations such as Mali, the Middle East, Kosovo, Bosnia and Herzegovina, Western Sahara and the Congo. Email “'It’s tough to be away from home': Varadkar visiting Irish troops in Lebanon ”. Feedback on “'It’s tough to be away from home': Varadkar visiting Irish troops in Lebanon ”.